PGM was established by an experienced team in the futures industry to serve both institutional and qualified individual investors. The PGM Managed Futures program helps our clients allocate to suitable managers through managed accounts. PGM provides its clients with access to highly skilled managers employing various styles, strategies and sectors. By using a quantitative and qualitative approach our veteran team guides clients through the allocation process to improve their underlying portfolios. PGM has developed a collaborative program for investors and managers. A good alternative investment is one that produces positive risk-adjusted returns (over a reasonable time frame) and exhibits a lower correlation to traditional investments. 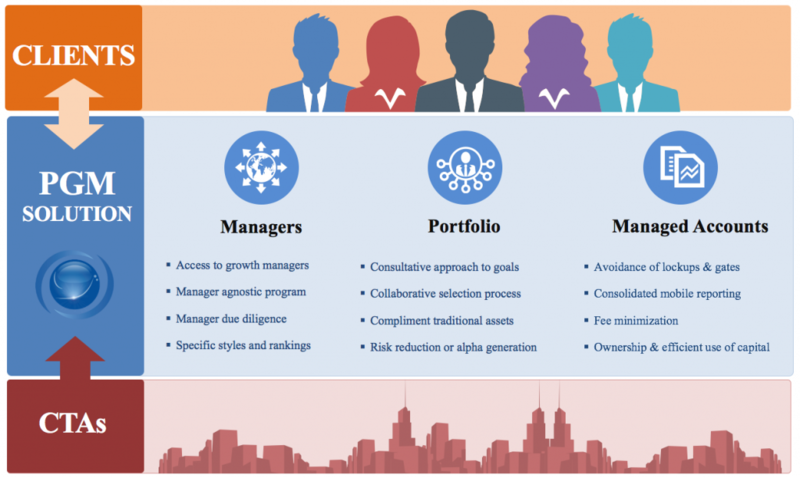 We believe growth managers will outperform mature managers. Separately managed accounts provide transparency, control, and risk management monitoring. Portfolio diversification begins with manager due diligence and selection process. Managed Futures, deployed intelligently across a number of managers, can be an effective compliment to traditional assets. Choose PGM Alternatives for your collaborative Managed Futures solution. Commodity interest trading involves substantial risk and is not appropriate for all investors. You should carefully consider your financial circumstances before investing with any commodity interest products. You should also be aware that electronic trading has inherent risks due to system response and access times which may vary due to market conditions, individual system performance, market volume and other factors. All information, publications, and reports, including this specific material, used and distributed by Paragon Global Markets, LLC shall be construed as a solicitation. Paragon Global Markets, LLC does not distribute research reports, employ research analysts, or maintain a research department as defined in CFTC Regulation 1.71. Material is provided for informational purposes. This presentation contains information obtained from third-party sources believed to be reliable. Paragon Global Markets, LLC has not independently verified the content and its accuracy and timeliness are not guaranteed. Past performance is not necessarily indicative of future results.